Kikyou sinking into the water...She's suppose to be death right? So I wanted a peaceful atmosphere around her like she's finally at peace. Bamboo trees symbolize peace within oneself. Scan from AnimePaper...took about 4 days to vector because I have lab work at Vandy. Her hairs were a pain. I know the bamboo trees doesn't look very good...I tried my best. They were drawn in Illustrator. The overall wall was probably about 30s layers...I think I spend about two weeks on this wallpaper. No brushes were used. wow thats a vector? Thats extremely good! I was looking for a Kikyo scan to vector when I found this and thought 'Wowies, finally a good scan for vectoring! ^^' then, boom, it turns out to be an incredible well done vector of my lovable Kikyo! Great job, I luv it! she looks like shes dreaming. 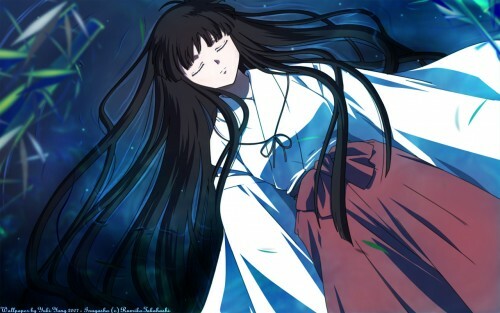 omg, I actually don't like Kikyo but here she looks amazing! Simply lovely! I've always been a fan of Kikyou's miko look...I love the feeling of serenity in this wallie. ??? ???????... ????? ???????? ?????! I love Kikyou. She is the best. Thank you for really nice wall.